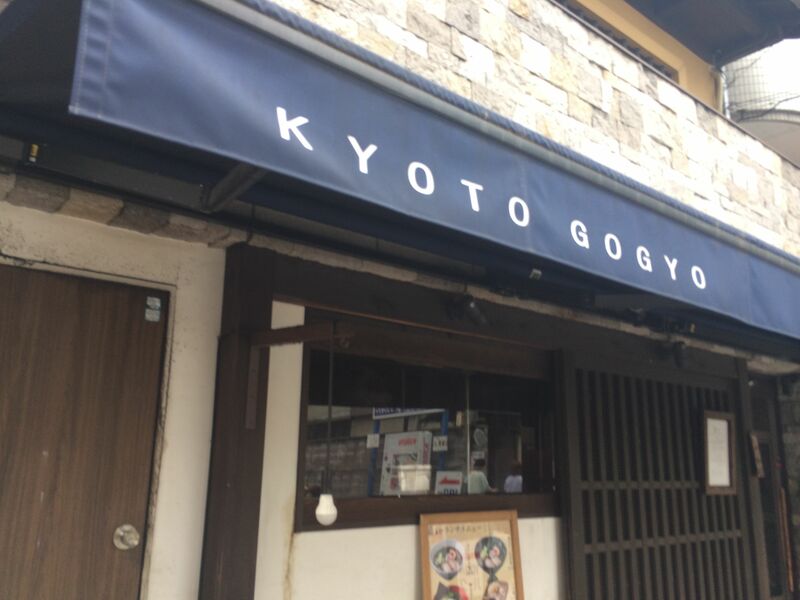 Kyoto is a great place to eat. I don’t think you can have a bad meal in Kyoto. As my best friend and I believe, life is too short for bad meals. 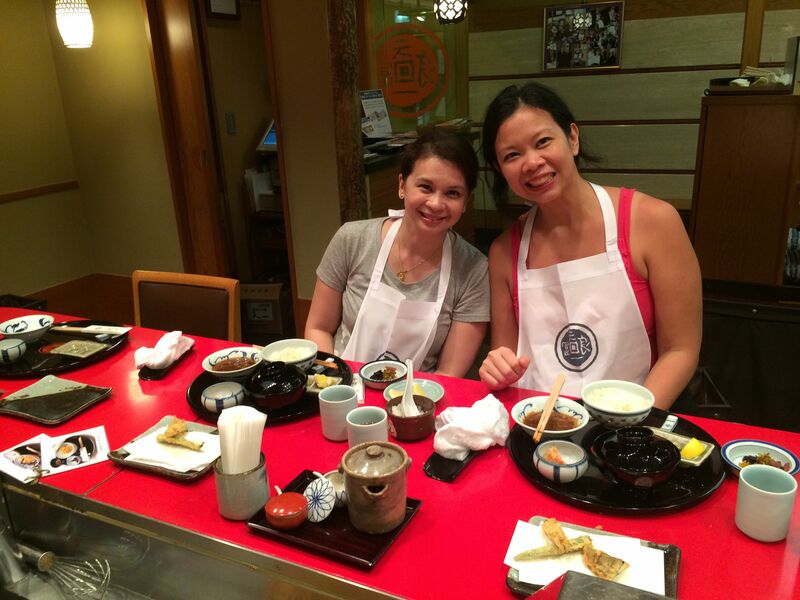 We made sure we ate well during our BFF40 holiday in Kyoto. We did some research online. As soon as I got my ticket to Osaka, I asked my friend Gaggan Anand, the chef behind Gaggan, Asia’s 50 Best Restaurant 2015, and #10 in World’s 50 Best 2015 for his recommendations where to eat.. 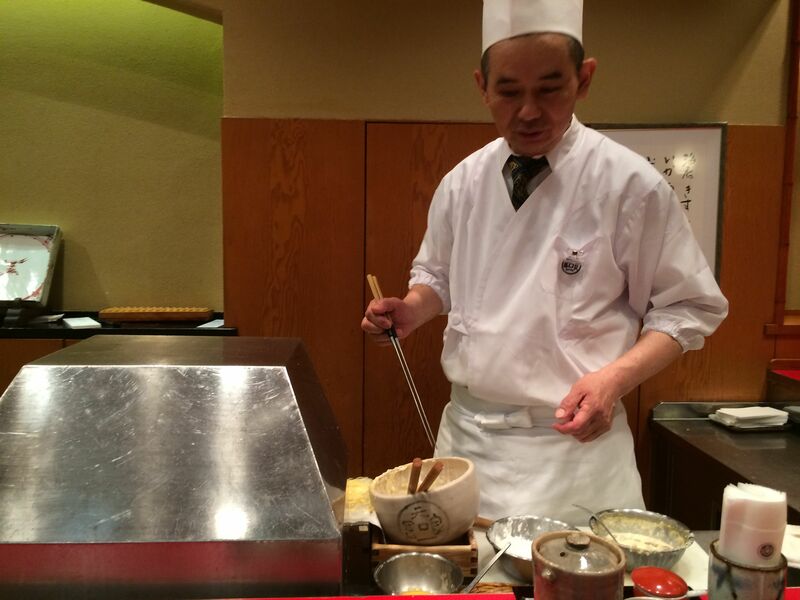 He sent me photos of two must try restaurants in Kyoto. To spare you from the guesswork, I’m sharing my list of Must-Eat places in Kyoto of tried and tested delicious eats in Kyoto. We landed in Kansai International airport at around noon. After immigration, getting an internet SIM card in the airport, buying our Train tickets and Haruka tickets, and taking the train to Kyoto, it must have about three pm when we reached Kyoto Station. With our suitcases, we headed straight to Ten-ichi for Tempura. 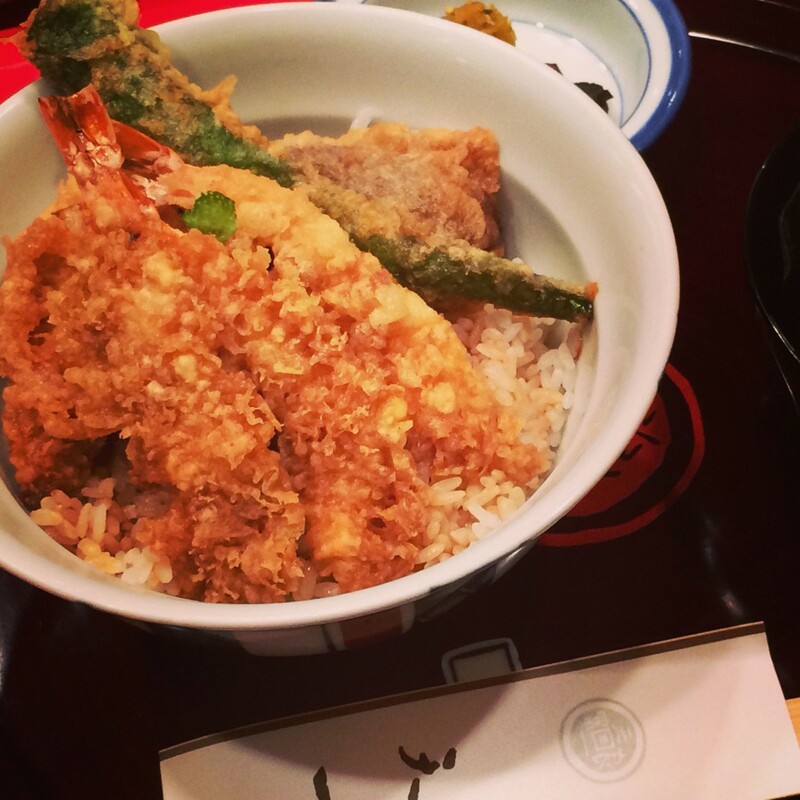 This restaurant is said to have the best tempura in the world. Ten-ichi was founded in the 1930’s, with several branches in Tokyo. It’s Ginza branch is most famous, with a montage of photos of famous people like Bill Clinton, Frank Sinatra, Henry Kissinger who have dined here. 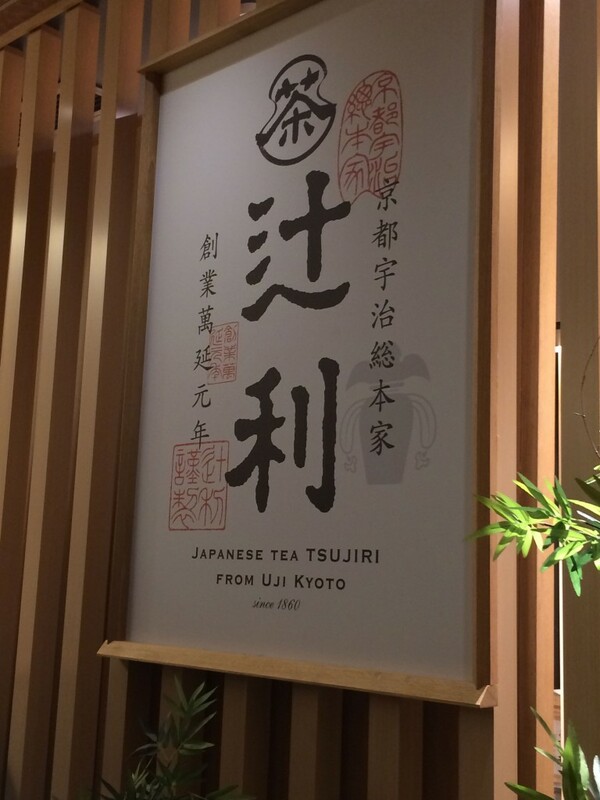 You will see the montage of greats who’ve dined here when you enter Ten-ichi at Kyoto Station. 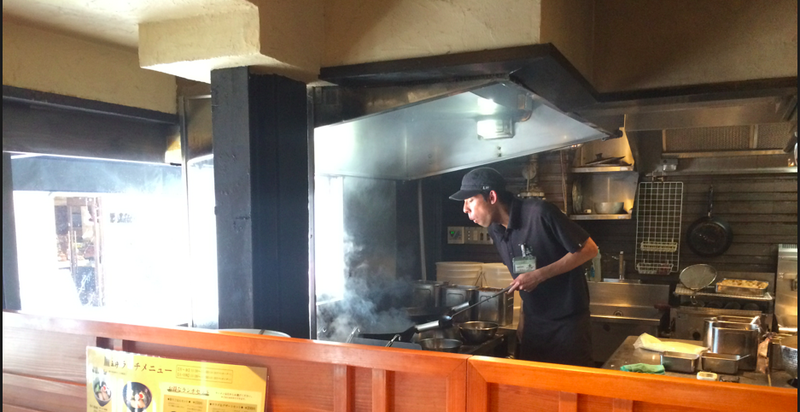 Tenichi’s chef skillfully cooking Tempura. The dinner service has more senior chefs. 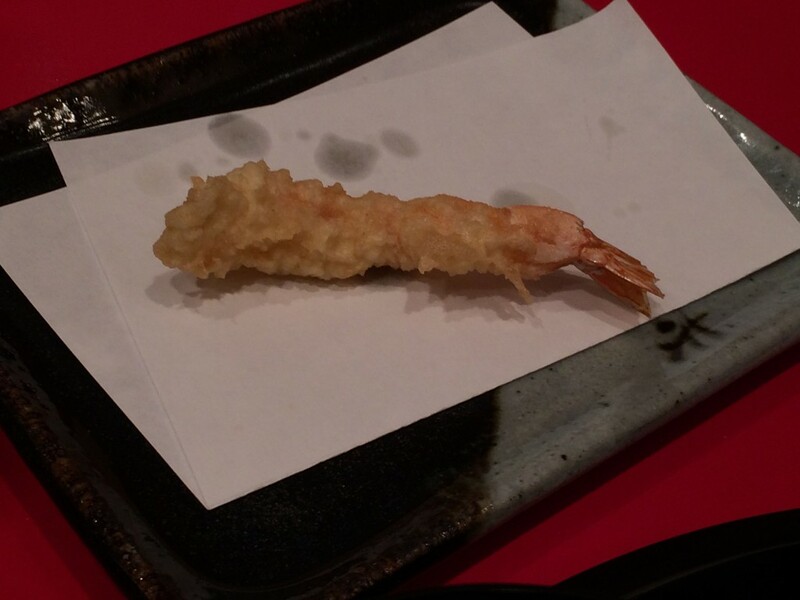 What makes the tempura so good? it is not at all oily. It is crisp and melts-in-your mouth. We enjoyed our lunch at Ten-ichi we ate there again for dinner. Dinner is more expensive but you enjoy a more senior chef educating you on the finer points of eating Tempura. The menu is also different, now including the divine deep-fried shrimp heads. It bursts with the freshness of the shrimp. 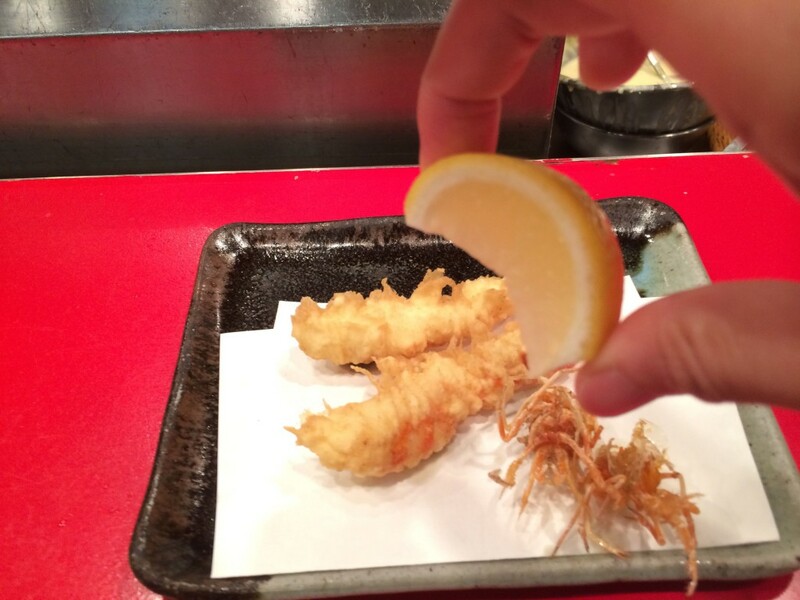 A squeeze of lemon on Ebi Tempura and super crunchy shrimp heads at Tenichi – so good! While I grew up dunking my tempura in ponzu sauce with grated radish, the chef will teach you to the intricacies of eating this fried specialty. One by one, it is served fresh from the sizzling wok: Shrimp heads, shishito peppers, … The chef directs us to eat one piece with salt and ground seaweed and a squeeze of lemon. Then, he lets you dip it in the Ponzu sauce. 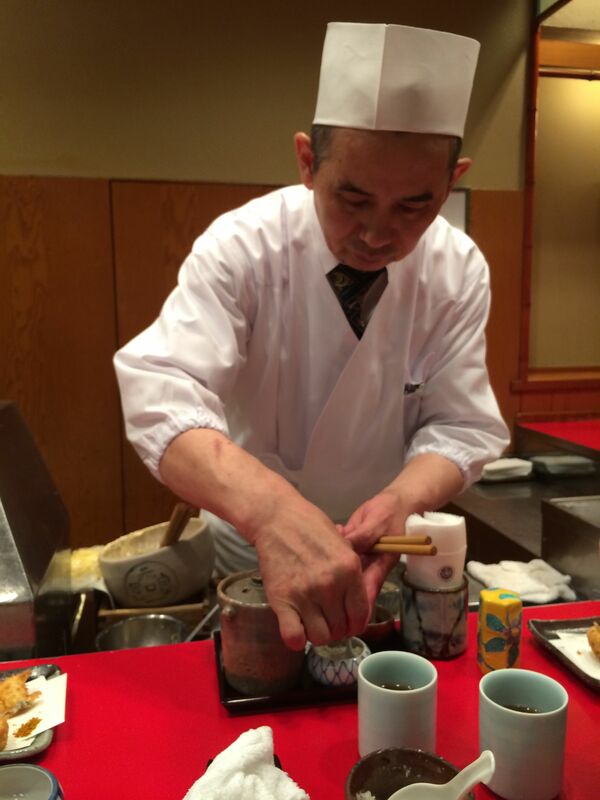 You can taste his artistry in frying with the lemon and salt, as opposed to the Ponzu. For the fish, he suggests using curry and salt. With every bite, the flavors change. It gives a new dimension to Tempura. At the end of the meal, he suggests you pour your ponzu sauce on your steamed rice. Proof of a good restaurant is choosing to dine here again on your last night in the city. Two happy diners at Tenichi on our last night in Kyoto! It is about US$40 for the dinner set (lunch is cheaper), but absolutely worth it. Thanks to the photo of a giant bowl of burnt shoyu ramen from Gaggan, I was had to eat in Gogyo Ramen on my birthday. After all, one needs to eat noodles on your birthday. The restaurant also happens to be just in an alley outside Nishiki Market, which was a place I wanted to visit on my birthday. Called Kogashi-men (burnt ramen), what makes it special? 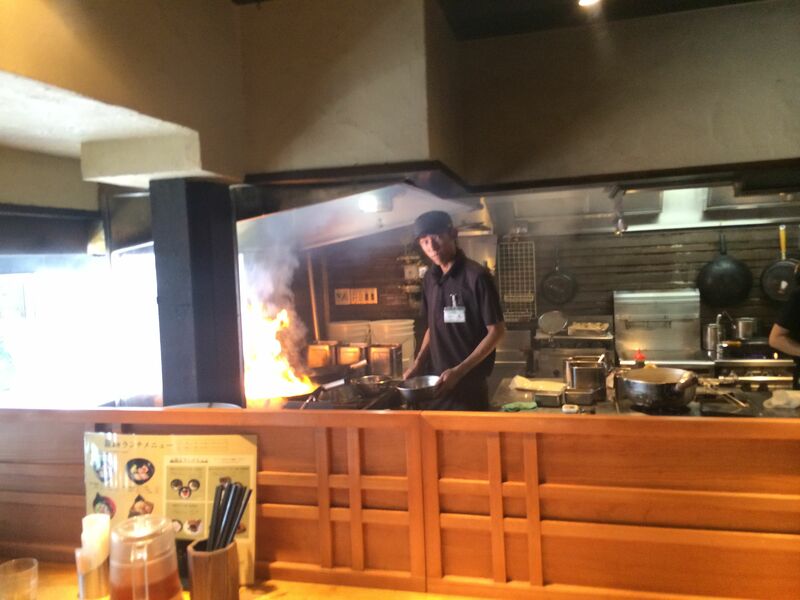 According to the menu, “the signature Kogashi ramen is prepared with lard flambéed in more than 300 degree Celcius. The dark and deeply flavored broth is scorching hot until the last spoonful.” There is the Kogashi Miso-men (with burn Miso Ramen) in a black bowl and Kogashi Shoyu-ramen with Burnt Soy Sauce Ramen. I had the Miso men and Rissa had the Shoyu ramen. Go for the Miso, the flavor just tingles perfectly in your mouth. (The Shoyu is a bit too salty for my liking). In the soup, you will see speckles of black, remnants of the burnt lard leaving a uniquely umami flavor in your mouth and lips! This is probably the best ramen I’ve ever had, opting t o have it with Char Siu (1,130 yen per bowl). 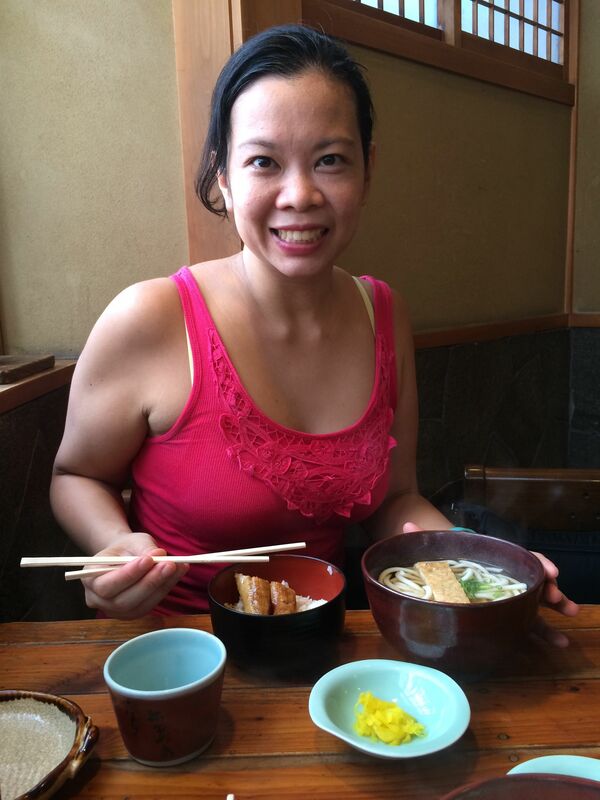 My 40th birthday noodles, Kogashi Miso-men at Kyoto Gogyo, a must! It is also a joy to watch the fiery spectacle as the chef cooks the lard. We were so excited for this meal that we arrived a few minutes before the restaurant opened. But judging from the wooden benches outside the restaurant, expect a queue to get a table. Gaggan’s photo of an old Japanese woman with purple hair and a blue robe grilling eel piqued my curiosity. The restaurant is Nezameya. 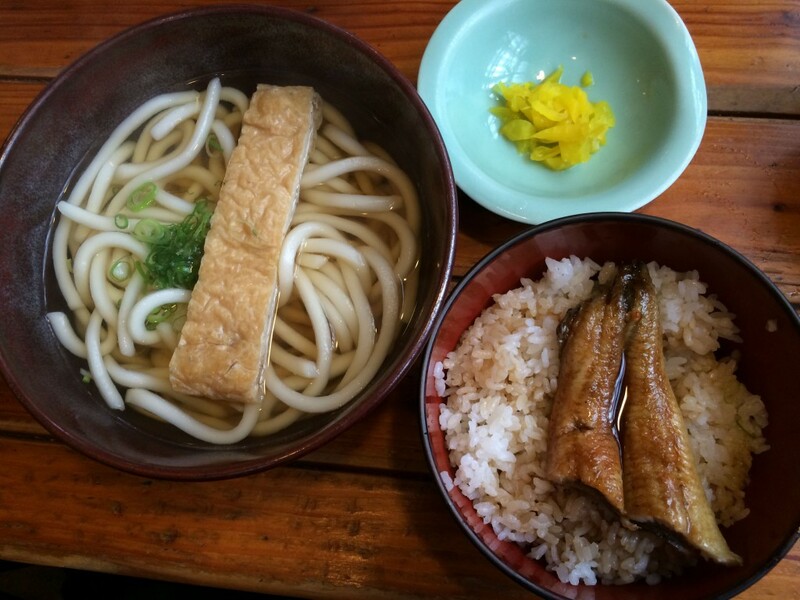 It is a few steps away from Fushimi Inari, making it perfect eats before or after your trek to the shrine’s summit. Having just Bearded Papa cream puff at one of the train stations and iced coffee from a vendo machine for breakfast, Rissa and I were hungry for lunch. We ordered the unagi rice set (2000 yen) with a Kitsune Udon (Udon with fried bean curd). 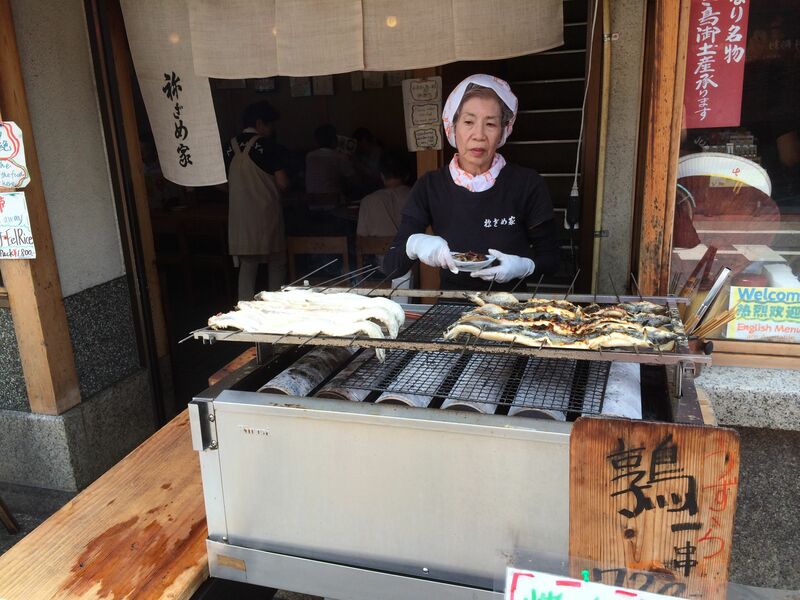 The eel is perfectly grilled, moist, not dry like the ones in Nishiki market. The sauce is perfect. Kyoto is known for its bean curd. This one was soft and slightly sweet. Founded in 1540, it is an old house known for its Unagi Don (eel rice bowl), Uzura Yaki (broiled quail), Inari Sushi (locally made tofu with rice) , and Saba Sushi (Mackerel sushi). The place is so busy. The website even lists some etiquette customers should follow: don’t bring food in from outside, order one dish each person, share your table, and leave quickly so others can use your table. Since it was our breakfast/lunch meal again, we were early. There was no need to share tables or queue up for one. But we did not linger, as the lunch crowd was building up. 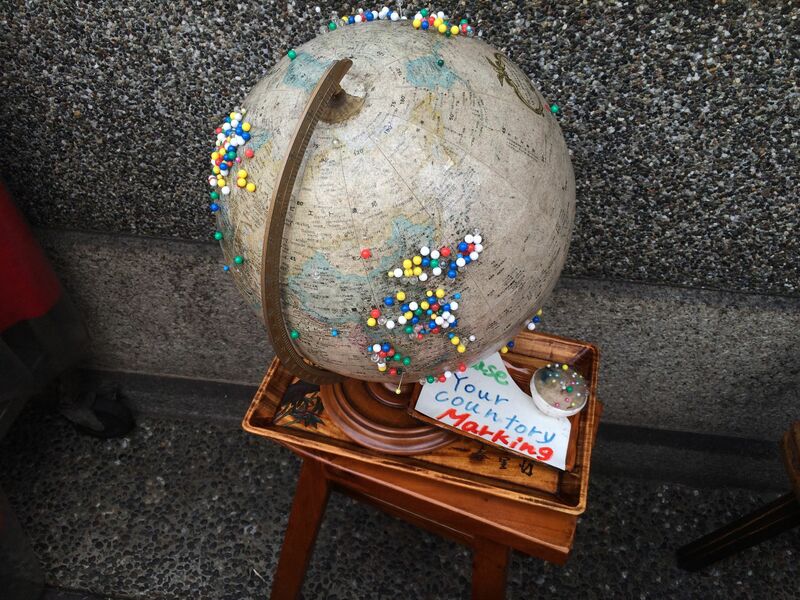 I do like the globe outside the restaurant with pins representing where they are from. Of course, I had to put a pin. Manila, represent! 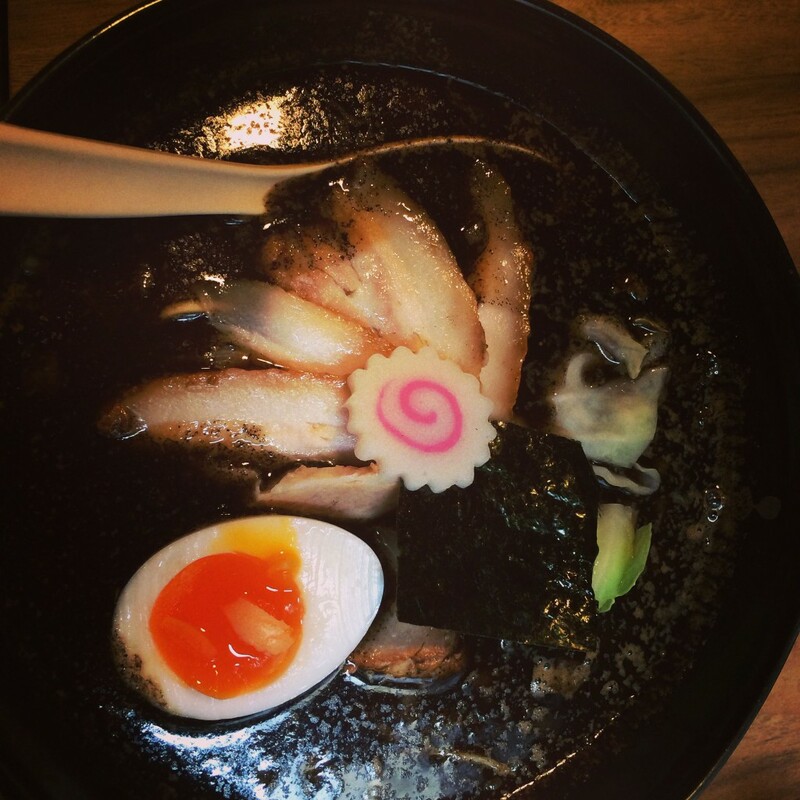 Nezameya’s globe of diners– Manila Represent! After sushi and ramen, Japanese beef is a must-eat in Japan. Although tired from the trek to the summit of Fushimi-Inari Shrine and wet walk home in the rain, we still managed to walk a few blocks from our hotel to Hiro Yakiniku for dinner. Hiro is a local Kyoto Yakiniku place. What began as a family-owned-meat shop 35 years ago is now a chain of 7 Yakiniku restaurants around Kyoto. 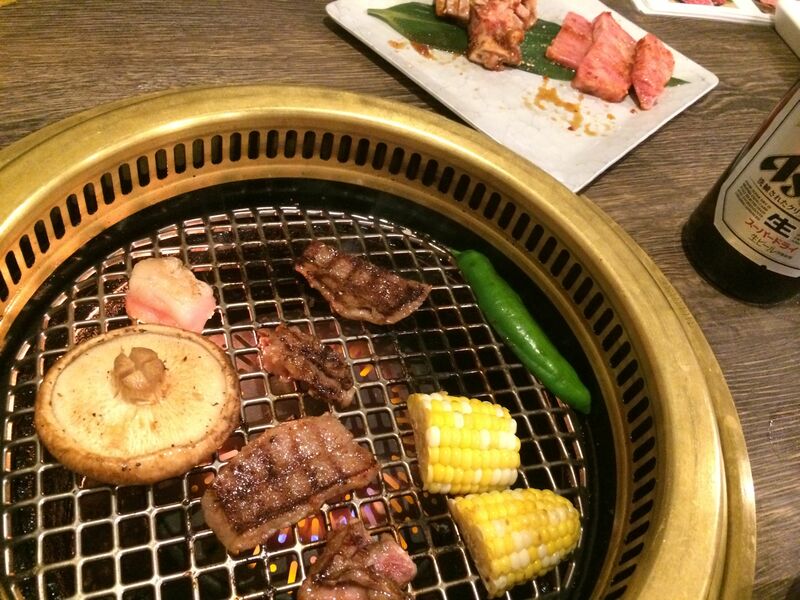 Meats served are not just from Kyoto but also Nagano and Kagoshima, too. I can’t recall the cuts of beef we ordered. But trust me on this. They were all melt-in-your mouth tender. We did try the Samgyeopsal (Korean style pork belly). We washed them down with a bottle of Asahi. 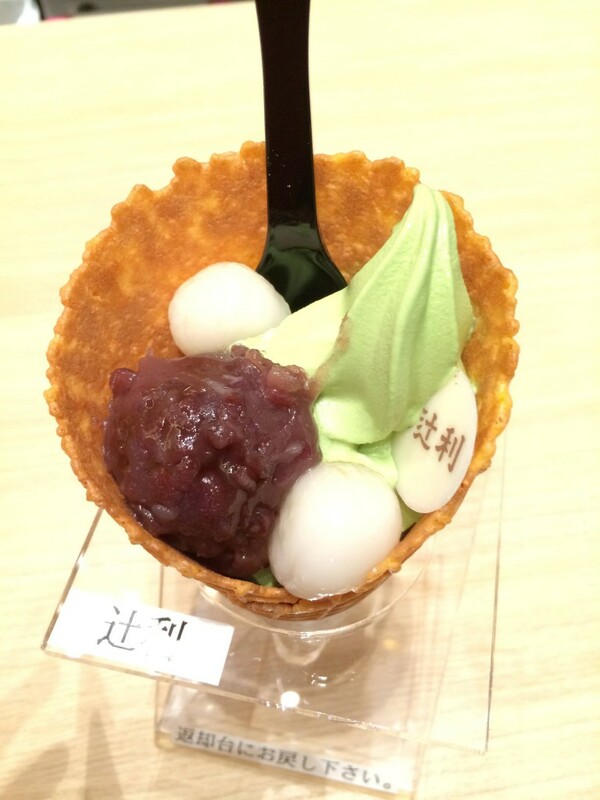 Our favorite green tea dessert place in Kyoto, right at the heart of Gion. Tsujiri is a 155-year-old Japanese traditional tea brand, daring back to 1860. Tsujiri now has branches in Japan, China, Taiwan, and Singapore, to the delight of matcha lovers. 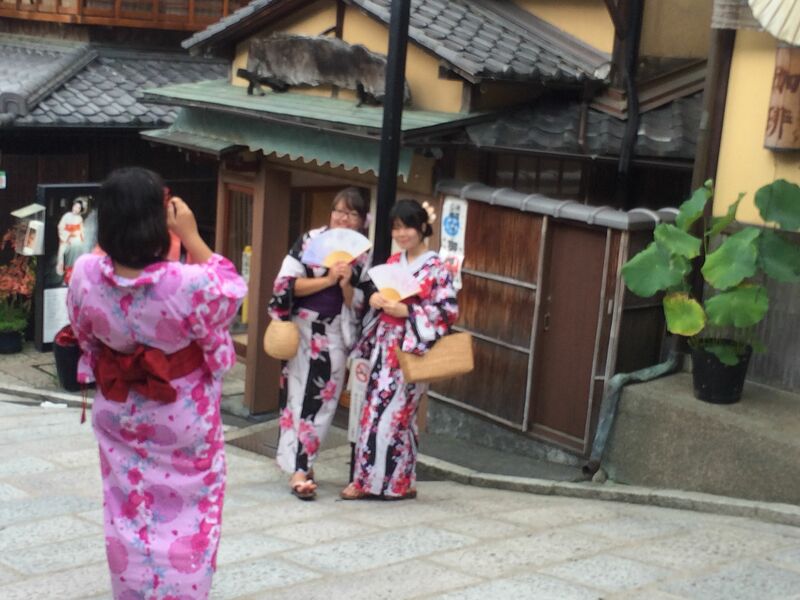 Since it was summer when we visited Kyoto and we were walking non-stop, it was necessary to cool down often. Our reward after our visit to Kiyomizu-dera was a stop at Kasagi-ya, a small wooden teahouse. Sweating from our temple visit and still sore from the previous day’s Fushimi Inari trek, we welcomed a cool treat. 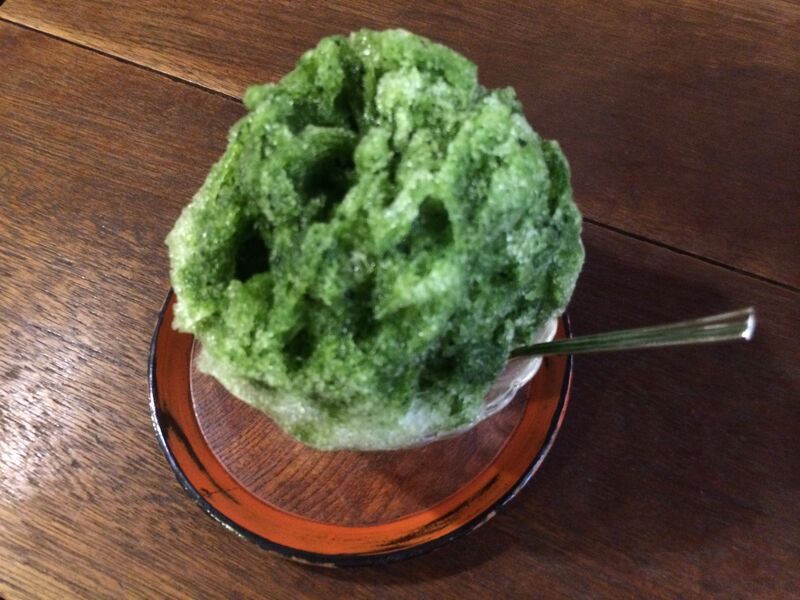 Known for their Kori Uji (Shaved ice with green tea syrup on top). When I posted it, a friend asked, “Are you eating Broccoli ice cream?) There are variations of it, like Kori Ujikintoki (shaved ice with sweet match and sweet red beans and two rice flour dumplings)for Rissa, and for me the Kori Ujishiruko with smooth azuki beans and two rice flour dumplings. 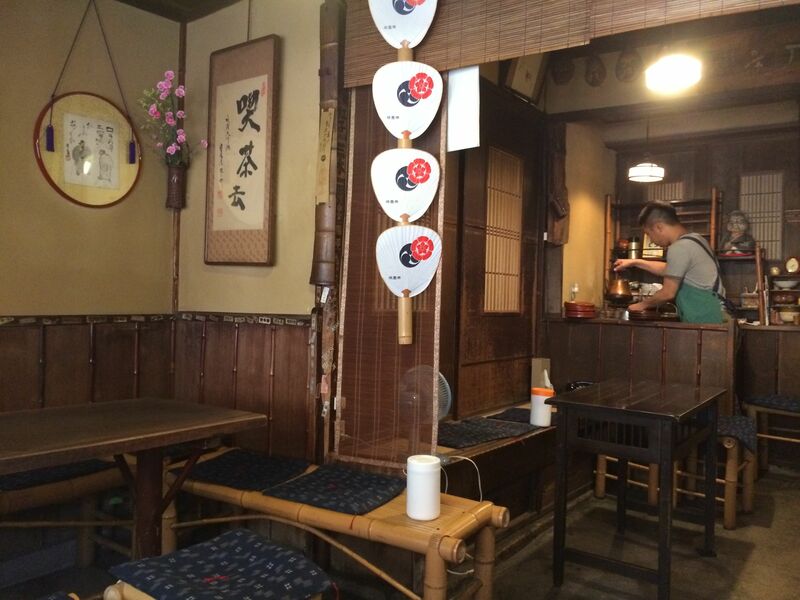 It is difficult to find this teahouse and with only a few chairs you can’t really linger. But it is an excellent refuge away from the tourists and the summer heat, even just for a few minutes. 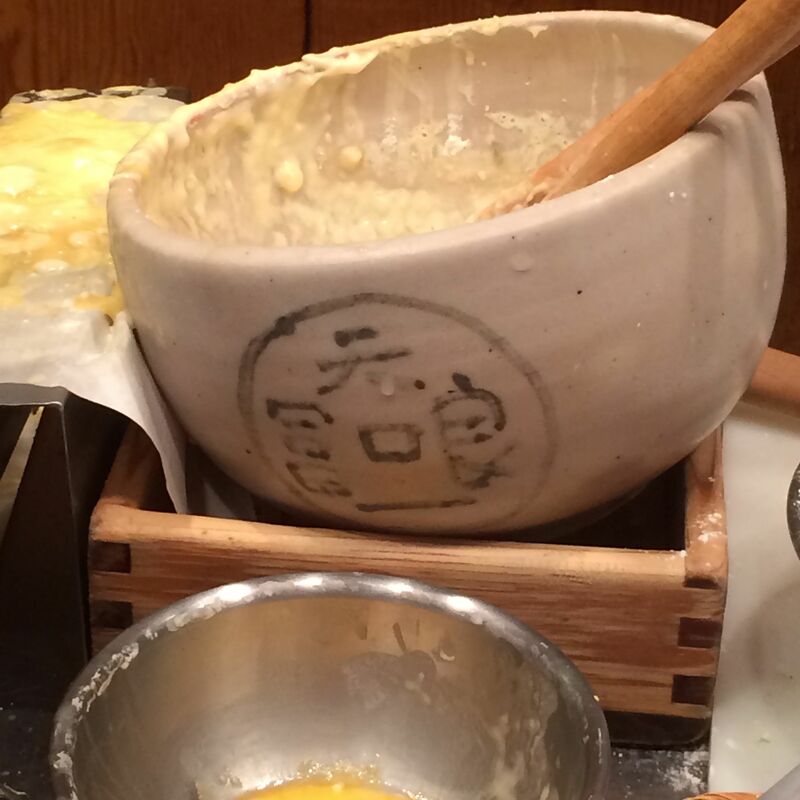 I do have one more must eat and must visit place in Kyoto– Nishiki Market! Wait for that post coming up soon….